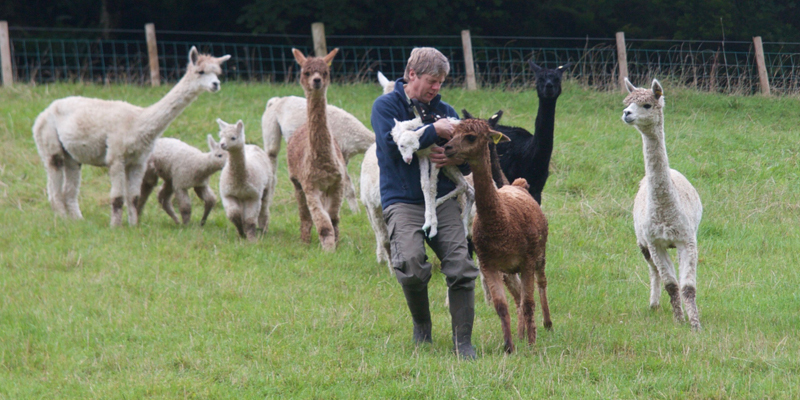 A Welsh Valley Alpacas Open Day is a great first introduction to these amazing animals but we know that for some of you that it is just not enough. Introduction to Alpacas lets you take it further. Introduction to Alpacas is intended to help you spend some quality time with our herd of friendly alpacas. It is a fun and enjoyable event for people who just love alpacas and want to see and know more. The session runs from 10 am to 1 pm with a break for refreshments. It is followed by a light lunch. After a brief time indoors to give some background, we head out into the fields to meet the alpacas. We will be around them in their paddocks and around the lake. There will also be the opportunity to feed them and understand how we care for them. We will include some time looking at the fleece and some of the things you can do with it. There will be plenty of photo-opportunities so do make sure you bring a camera. The alpacas love to show off and they are as interested in you, as you are in them. Meeting alpacas is a half-day session with light lunch and refreshments provided. The cost is £50 per person and is intended for over 16’s. We limit the group size to no more than 6 so that everyone has the opportunity to be close to the alpacas and have their questions answered. If you have special dietary or other needs, do let us know and we will do everything we can to accommodate you. We run this course regularly but can also organise one specifically for you and your family or friends. Contact us to discuss your preferred dates.